She's Fantastic: Lord of the Rings GALADRIEL! Lord of the Rings GALADRIEL! The Lord of the Rings Trilogy produced a ton of excellent toys between 2001-2009. The movies were epic and gave new life to many characters who shockingly had little to no merchandising before this. I was always aware of Galadriel from the books and animated movie. I viewed her as a voice of reason and guidance, similar to Sorceress in He-Man. But when Cate Blanchett stepped into the role, Galadriel instantly became elevated to a goddess-like overseer. Perhaps that is what Tolkien had intended all along, but it took Peter Jackson and Blanchett to make me see that vision. I just saw the first installment of the new Hobbit trilogy last Friday and I am so glad to see this role reprised.. I just can't get enough of her. Toy Biz was a pioneering company in the action figure world. They picked up on the early success of Kenner and ran with it, pretty much dominating the 1990's and early 2000's. Near the end of their streak (and shortly before being rebranded as Marvel Toys), they hit a second niche market for movie-based toys. The Lord of the Rings trilogy seems to have been their most successful venture into this market by far. One very confusing thing about collecting these LOTR toys from Toy Biz is the high occurrence of re-releases and re-packaging of already released figures. 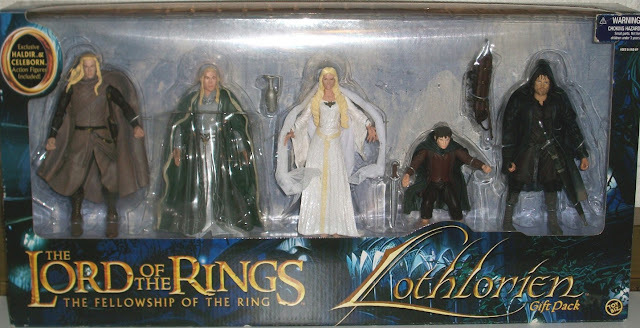 As far as I can tell, this figure of Galadriel was released three times. Once as a single-pack in the Lord of the Rings: Fellowship of the Ring - Series 1 from 2003, a second time as a multipack in the Lord of the Rings: Fellowship of the Ring - Lothlorien Gift Pack from 2005, and a third single-pack that I haven't been able to research properly. Perhaps it's just alternative packaging for the Series 1 release. The "action feature" detailed on the cardback is hilarious. It says that her hood is an authentic costume. Just what all the kiddies are clamouring for! The figure is beautiful. She comes with bundles of cloth forming her robes and undergown, but honestly they don't hang or fit right and just get in the way. I found Galadriel very difficult to photograph. On a white background, her colors come off as pink, and on a black background she looks blue. But in person, she is all white and off-white, with pale blonde hair, and pearlescent costume details. The likeness to Cate Blanchett is very good, however sometimes I look as her and think I'm looking at Claire Danes. Oh yeah, check out that authentic costume action feature! Okay, let's strip off the silly cloth accessories and see the true sculpt under all that fluff. The Elven Queen of the Kingdom of Lothlorien, sees into the hearts of those who seek her aide through her mystical powers. She provides prophecies and invaluable gifts to the Fellowship for their journey. Galadriel comes with a small pitcher accessory for her to pour the waters of Lorien into her Mirror. I love the toy with the exception of her hands - I think they were reused from Gollum. I'm not sure why ToyBiz didn't sculpt new ones: it couldn't have been that expensive. I totally forgot to gripe about the hands... good call on the gollum re-use, I just checked out some pics and I think you are right. Th crazy thing is that the Coronation Gown Arwen uses almost an identical body but with properly-scaled hands. I'll be posting a review of her shortly. The first few years of TB LOTR gave us some really amazing toys. The later years did too, though the toys seemed to get a bit smaller towards the end. Never did get Epic Scale Balrog! Galadriel is such a beautiful figure. I still need to buy the transfixed blue version. Also need to get the Armoured & second (much nicer looking) casual attired Eowyn figures. I have the Eowyn you pictured above & the Coronation box set version (which is also nice).